TDC Less Work More Fun Ad 1954 This is a March 5, 1954 advertisement. 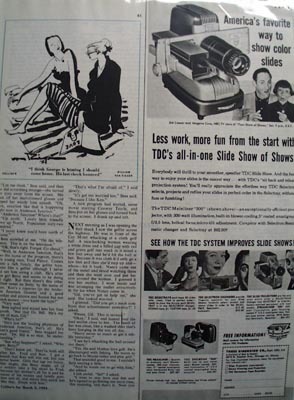 It is a nice black and white ad from Three Dimension Co of Chicago, makers of TDC Projector. Has some pictures of Sid Caesor and Imogene Coco, stars of Your Show of Shows and of the Projector. It reads, ""Less work, more fun from the start with TDC's all in one slide show of shows. In excellent condition. Photo is taken through plastic and may show wrinkles or crookedness that is not in the ad. This magazine tear sheet measures 5 1/2"" wide by 13 3/4"" tall. Items Similar To "TDC Less Work More Fun Ad 1954"